Minnesota Rising: Congressman Keith Ellison to speak on "The Generosity of Inclusion"
Congressman Keith Ellison to speak on "The Generosity of Inclusion"
What the world needs now is love, sweet love. And the belief that everybody counts and everybody matters. Join Representative Keith Ellison, from Minnesota's 5th, and most culturally and ethnically diverse, congressional district to hear his proposal that a politics of generosity and inclusion is a practical, realistic, and economically viable approach that is more likely to end wars and achieve peace. Stand up and be counted amongst attendees this Thursday at Westminster Presbyterian Church. 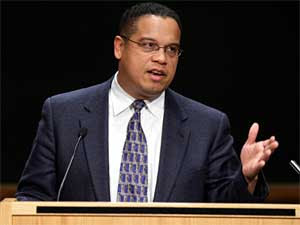 Keith Ellison represents Minnesota’s Fifth Congressional District in the U.S. House of Representatives. A member of the Minnesota Democratic-Farmer-Labor Party, he is the first Muslim to be elected to the United States Congress. Before his election to national office, he served two terms in the Minnesota State Legislature, representing District 58B. In an era of fear and polarization, he offers a message of hope, reconciliation, respect, and inclusion. Music precedes the forum at 11:30 AM. Public reception follows at 1:00 PM. Free and open to all! Questions? Contact Susan McKenna at 612-332-3421, or smckenna@wpc-mpls.org.